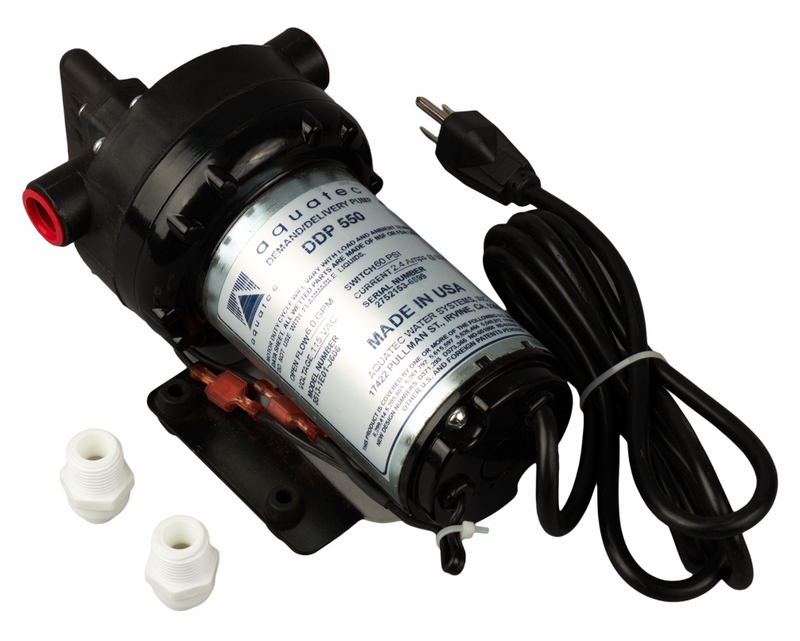 Pressure Booster Pump - Stealth-RO100/150/200/300 This pump connects inline before your RO system. It has 3/8" QC connections. It comes with a transformer and a high pressure switch. This is the European version of the Pressure Booster pump, which runs on 230V. 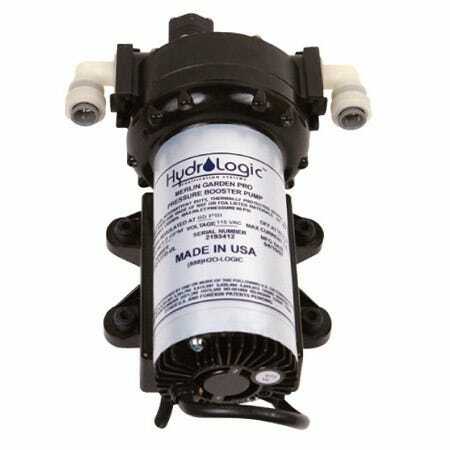 Set the Hydro-Logic Pressure Booster Pump to 65 psi to create optimum flow rate. 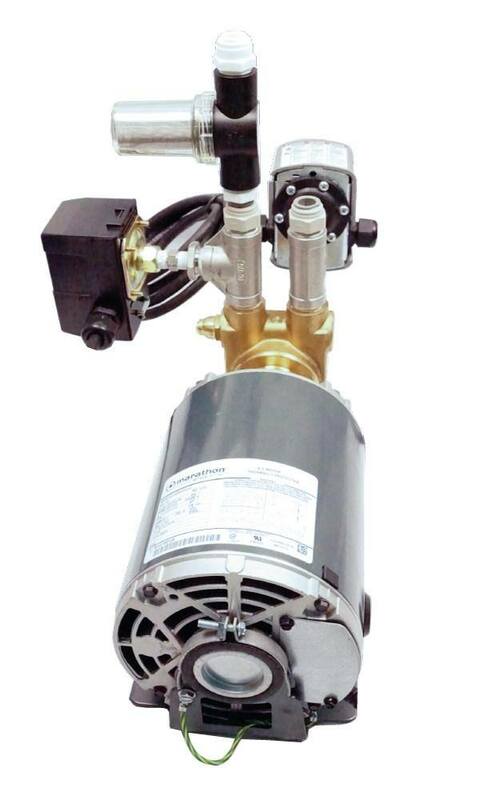 Hydro Logic Pressure Booster Pump Continuous for Evolution RO 1000 110V This heavy duty commercial booster pump is designed for continuous use. It has low pressure and high pressure options. 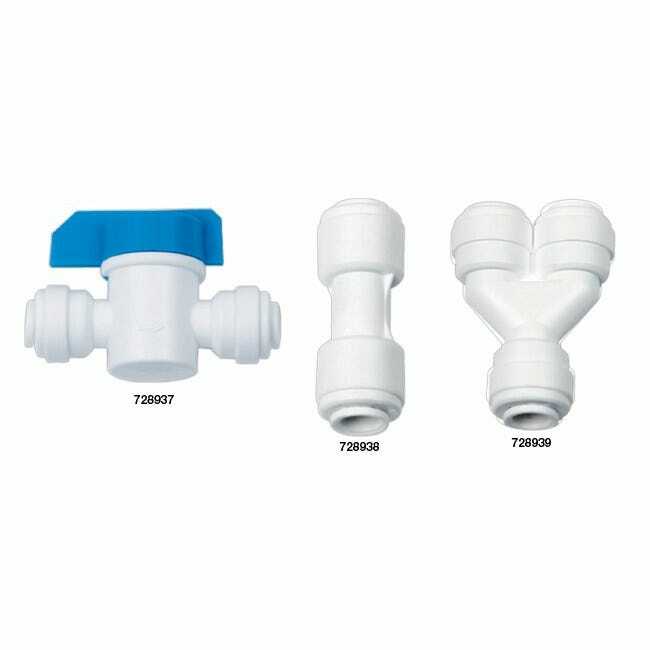 It can be used in conjunction with a float valve. It has an adjustable pressure dial. It operates through plugging into a 110V DC source. The Pressure Booster Pump includes a pump protector, an inlet filter, and 1/2" QC fittings. It does not thermally cycle. 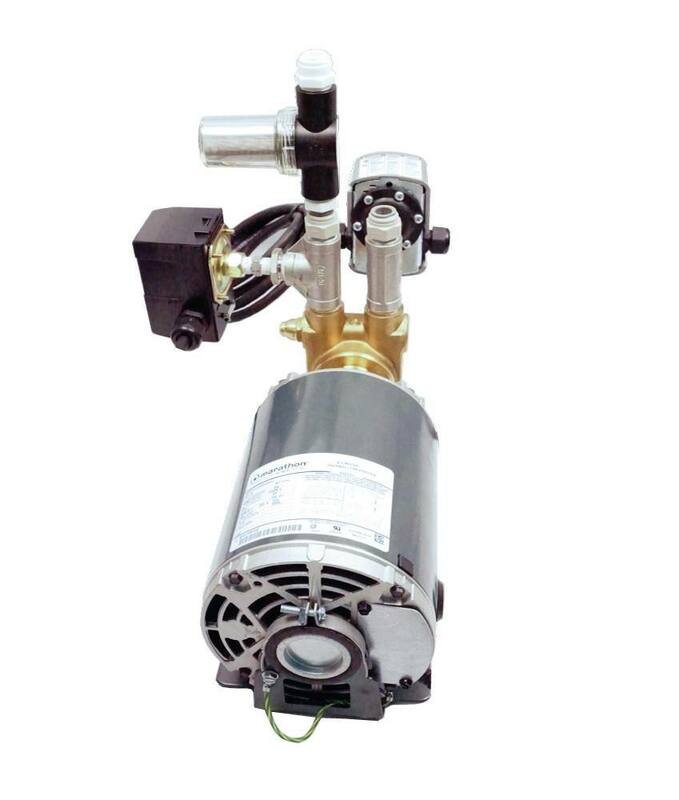 The Pressure Booster Pump is designed to run continuously 24/7. It is a work horse pump that powers the Evolution-RO1000 to 80 psi and is also compatible with Hydro-Logic's 1000-1500 GPD RO systems. It boosts these systems up to 150 psi. This pump requires at least 20 psi to operate. 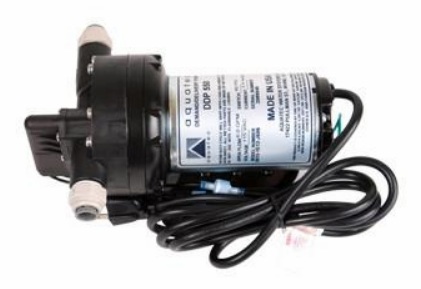 Hydro Logic Pressure Booster Pump Continuous for Evolution RO 1000 220V This heavy duty commercial booster pump is designed for continuous use. It has low pressure and high pressure options. It can be used in conjunction with a float valve. It has an adjustable pressure dial. It operates through plugging into a 220V DC source. The Pressure Booster Pump includes a pump protector, an inlet filter, and 1/2" QC fittings. It does not thermally cycle. The Pressure Booster Pump is designed to run continuously 24/7. It is a work horse pump that powers the Evolution-RO1000 to 80 psi and is also compatible with Hydro-Logic's 1000-1500 GPD RO systems. It boosts these systems up to 150 psi. This pump requires at least 20 psi to operate. This pump is designed to be installed before the Stealth-RO to boost the inlet pressure. There needs to be at least 40 psi and up to 80 psi of inlet pressure for the Stealth-RO to function properly. People on wells and other situations of low pressure can benefit greatly from this pump. It boosts the pressure significantly, allowing the Stealth-RO to run with higher flow and efficiency while having better TDS removal. The pump is designed for long service life and runs very quietly. This pump is designed to be installed before the Merlin-Garden Pro to boost the inlet pressure. There needs to be at least 40 psi and up to 80 psi of inlet pressure for the Merlin-Garden Pro to function properly. People on wells and other situations of low pressure can benefit greatly from this pump. 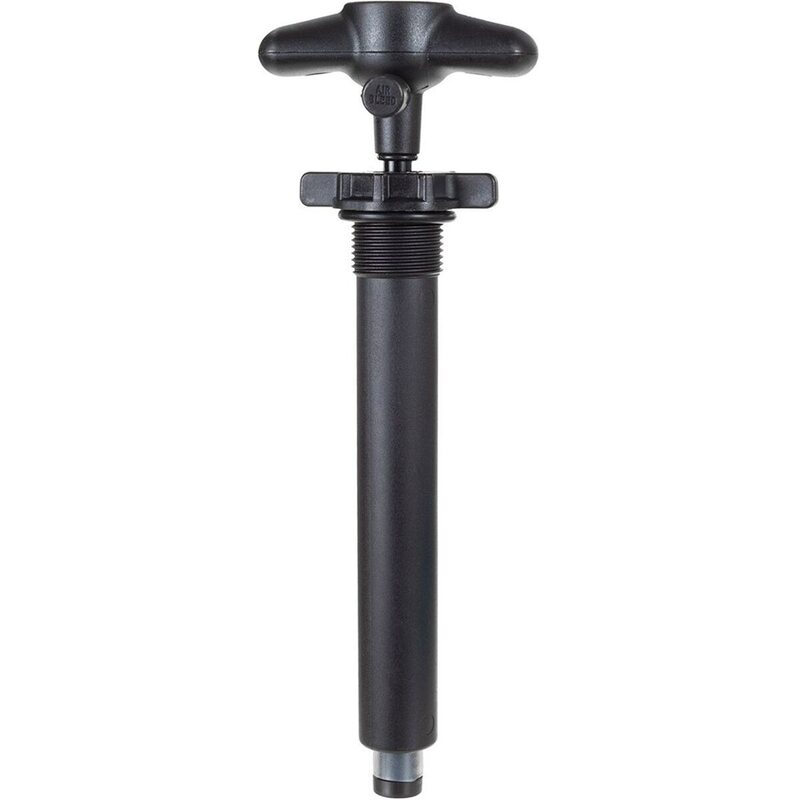 It boosts the pressure up to 65 psi allowing the Merlin-Garden Pro to run with higher flow and efficiency while having better TDS removal. The 5 diaphram pump, specifically designed for the Merlin, is a workhorse but runs quietly. Comes with 120v cord and 1/2" quick connect fittings. 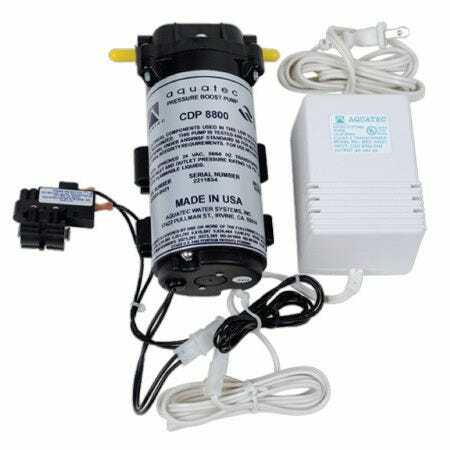 Hydro-Logic Demand Delivery Pump - 3.2 GPM This reverse osmosis water filter can process 3.2 gallons per minute. It has 1/2 inch QC fittings. The Demand Delivery Pump runs on 115v AC. It is a great addition to your indoor hydroponic garden. Break out the RinseKit Pressure Booster Pump to pressurize your RinseKit without having to be close to a hose bib or sink. This pump is compatible with the RinseKit PLUS and LUX models, and easily screws into one of the accessory ports for compact use. A built-in gauge ensures proper pressure, while the corrosion-resistant plastic construction helps extend its life when used out in the elements. Plus, this pump helps you add pressure to your RinseKit when the water pressure at your house is just too low. .Highlights:.On-demand operation. Only runs when water is flowing. Corrosion-resistant stainless steel pump body. Assembled, ready to install; includes 6' 115-volt power cord. Offers a maximum additional pressure of 40 PSI. Specifications:.Body construction: Stainless Steel. Horsepower: 3/4 HP. Pressure boost at 1 GPM: 38 PSI. Pressure boost at 5 GPM: 35 PSI. Pressure boost at 10 GPM: 31 PSI. Pressure boost at 20 GPM: 14 PSI. Voltage: 115v, 60 Hz. AMP draw: 7.2 amps at full flow. Power cord: 6' with 3-prong grounded plug. Inlet/Outlet sizes: 1" female NPT. Maximum pressure: 50 psi (345 kPa). This is the replacement feed valve for the Small Boy system. Protects booster pump from sediment and other particles. Cleanable stainless steel mesh screen. Clear housing. 1/2 in fittings included to hook directly onto inlet of pump. Mandatory for pump unless a PreEvolution for your Evolution RO1000 or a Tall Blue pre-filter for your Merlin Garden Pro. Works with all pumps with 1/2 in connections. Protects booster pump from sediment and other particles. Cleanable stainless steel mesh screen. Clear housing. 3/8 in fittings included to hook directly onto inlet of pump. Mandatory for pump unless using dedicated pre-filter for your Stealth RO or Triton RO. Works with all pumps with 3/8 in connections. Hydro-Logic Quick Connect to Inline Shut Off Valve for Stealth/Small Boy System -- 1/4"
Hydro-Logic Quick Connect to Union Connector for Stealth/Small Boy System -- 1/4"
Hydro-Logic 2 Way Splitter for Stealth/Small Boy System -- 1/4"
* Note: This item cannot currently be shipped Internationally (US only), we apologize for any inconvenience. * The Hydro Logic Stealth 150 can produces up to 150 GPD (gallons per day) of ultra-pure, low PPM water that your plants will love. It removes 98%+ of chlorine & contaminants that can kill your beneficial microbes. The Stealth series is designed to waste approximately 25% less water than other Reverse Osmosis (RO) systems. The Hydrologic Stealth 100 comes complete with everything you need to for a quick hook-up (Filter wrench, drain and inlet line, garden hose connector, etc). The Hydro Logic Stealth 100 is customized for demands of the gardening & hydroponics industries. Note: the performance of the stated flow rates are based on 77 F, 60 psi, 550 ppm inlet water. Booster pumps are available to help achieve this flow rate. 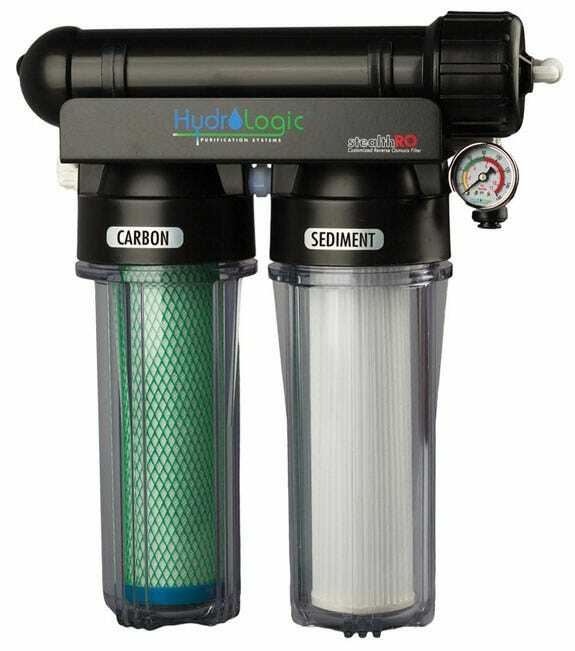 3 Stage RO Unit 1 RO Membrane Carbon Filter Cleanable sediment filter Automatic shut-off Size: 15"H x 14"W x 5"D 1 year warranty Hydro-Logic Filter Replacement Schedule: Membrane Element: Every 6 months to 2 years dependent of use and input water quality. Green Coconut Carbon Filter: Every 1,250 gallons of purified water. Sediment Filter Pleated: Clean regularly, change every 6-12 months. Low Pressure, Cold Water, High Flow membrane: Every 6 months to 2 years dependent of use and input water quality. KDF85/Catalytic Carbon Filter: Every 2,000 gallons of purified water. 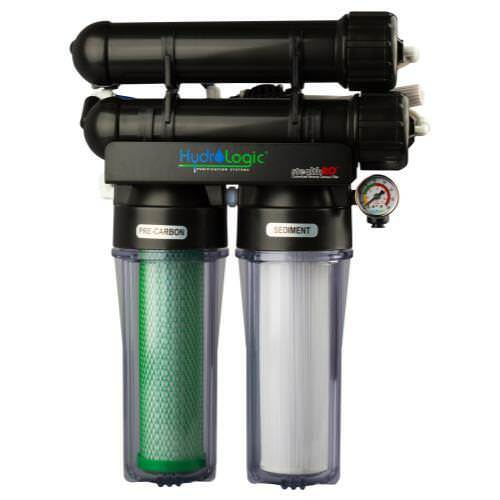 The Hydro-Logic 200 GPD Reverse Osmosis filter is a 4 stage water filtration unit comprised of a membrane, carbon, and sediment filter. 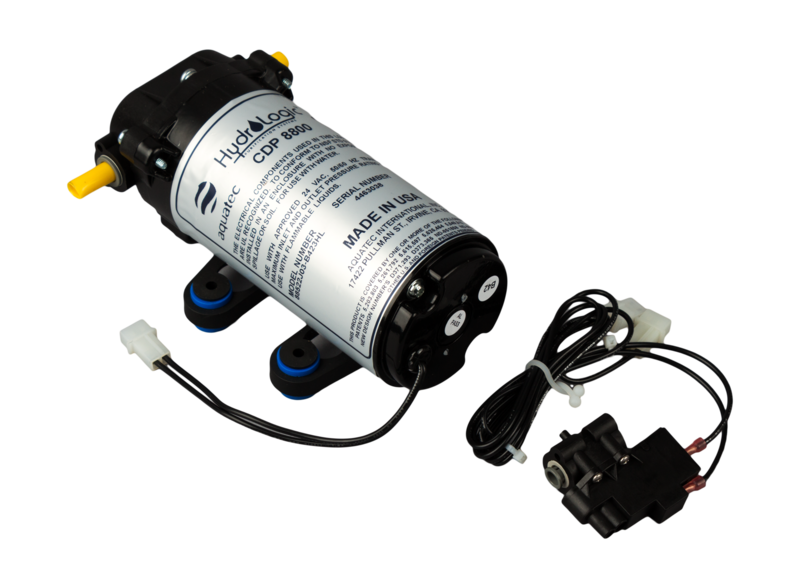 The Hydro-Logic Stealth RO systems is designed for use with hydroponic and horticultural applications. 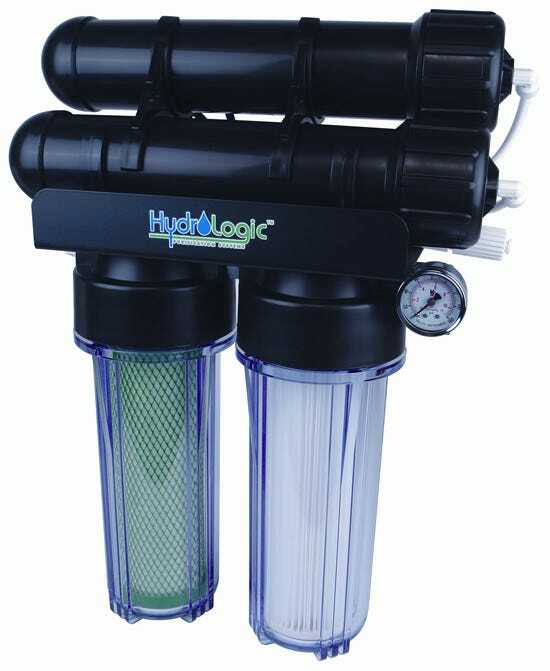 Hydro-Logic Stealth RO 200 The Stealth-RO200 produces 200 GPD of ultra pure water. Removes 98%+ of all contaminants in your tap water. Leading the industry in efficiency the Stealth has a 2:1 waste to product water ratio. Optional 1:1 ratio flow restrictor saves 50% more waste water. Optional high flow, low pressure, cold water membrane increases production to 400 GPD for Stealth-RO200. Customized for gardening and hydroponics. Includes: 4-Stage RO Unit 2 RO Membrane Carbon Filter Cleanable Sediment Filter Automatic Shut-Off Cartridge Wall Mountable Metal Bracket Garden Hose Connector lnline Shut-Off 8 ft. RO & Drain Line 5 ft. Inlet Line Filter Wrench Instructions Unit size: 15" x 14" Weight: 11.9 Ibs Limited 1 year warranty. Hydro-Logic Filter Replacement Schedule: Membrane Element: Every 6 months to 2 years dependent of use and input water quality. Green Coconut Carbon Filter: Every 1,250 gallons of purified water. Sediment Filter Pleated: Clean regularly, change every 6-12 months. Low Pressure, Cold Water, High Flow membrane: Every 6 months to 2 years dependent of use and input water quality. KDF85/Catalytic Carbon Filter: Every 2,000 gallons of purified water. 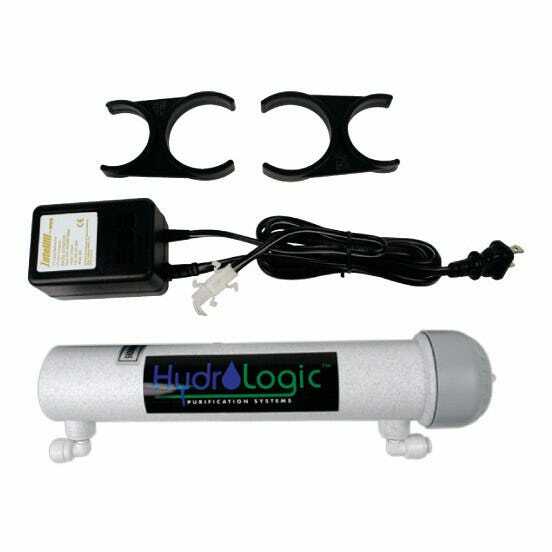 The Hydro-Logic Stealth RO 300 produces 300 GPD of ultra pure water. Removes 98%+ of all contaminants in your tap water. Leading the industry in efficiency the Stealth has a 2:1 waste to product water ratio. 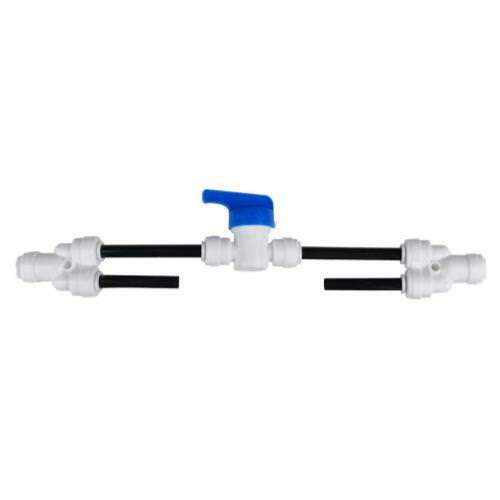 Optional 1:1 ratio flow restrictor saves 50% more waste water. Customized for gardening and hydroponics. Includes: 3-Stage RO Unit 2 RO Membrane Carbon Filter Cleanable Sediment Filter Automatic Shut-Off Cartridge Wall Mountable Metal Bracket Garden Hose Connector lnline Shut-Off 8 ft. RO & Drain Line 5 ft. Inlet Line Filter Wrench Instructions Unit size: 15" x 14" Weight: 11.9 Ibs Limited 1 year warranty. Hydro-Logic Filter Replacement Schedule: Membrane Element: Every 6 months to 2 years dependent of use and input water quality. Green Coconut Carbon Filter: Every 1,250 gallons of purified water. Sediment Filter Pleated: Clean regularly, change every 6-12 months. Low Pressure, Cold Water, High Flow membrane: Every 6 months to 2 years dependent of use and input water quality. This item has been discontinued, Please try our selection of Replacement RO Filters, Accessories for an alternative. Ultra Violet Sterilizer add on kit provides 100% protection against bacteria, viruses, cysts, and pathogens in the product water. Great for well or surface water sources. Ensures the safest water. For use with Stealth-RO or any other RO systems with 1/4 in fittings and up to 1/2 GPM flow rates.